Ledia Carroll used a field line chalker to draw the perimeter of Mission Lake (aka Lago Dolores) in the Mission district of San Francisco, a former freshwater lake, in her Mission Lake Project. 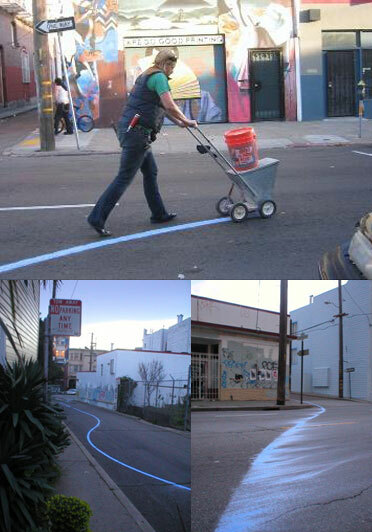 The full perimeter outlined with a blue chalk line will mark the shoreline of a now vanished lake in the Mission District that stretched roughly over a five-block diameter from (what is now) Van Ness to Guerrero and 15th to 20th Streets. A lakeside barbeque, perimeter bike race, and guided tours of the underground waterways round out the project. Mission Lake Project is sponsored by SoEx Off-Site, a yearlong series of public art projects investigating diverse strategies for exploring and mapping public space.